This year Chinese New Year was quite dull and boring. The more I grew, the more I lost the excitement. Celebrated at my late maternal grandparent's place. No gambling this time. Just more to chit chatting and eating. Had a family reunion again that night (had a CNY-Eve dinner the day before) in a restaurant. I only had little photos this year. That's it. Basically that's what I did for the first day. Can't remember what I did in the morning. probably went for some house visiting. Had an open house invitation by Shawn during the night. I'm using my lousy Olympus camera coz the boyfie took the camera back with him to his hometown. That explains why I don't take much photos for CNY. Went to Casa De Cafe for yumcha session after that. Basically it's all about food food food and more food. Day three was one hell of a tiring day. Visited friends house from 11.30am until about 5pm. Picture sources are all taken from iPhone 5. Credits to Kenny Ong. Sorry for misusing your phone to capture my shameless face. haha. Such a bad hair day. All of us are from the ONG family. Muahahahahaha!! Had another round of family reunion dinner on Day Three. Enjoyed my day to the maximum. I had to work on Day Four. No extra holidays given. No more house visiting except for Day 6. Wilson had a small open house where he only invited minimum amount of friends to his place. Lepak at Station 1 until 2am before heading back home. 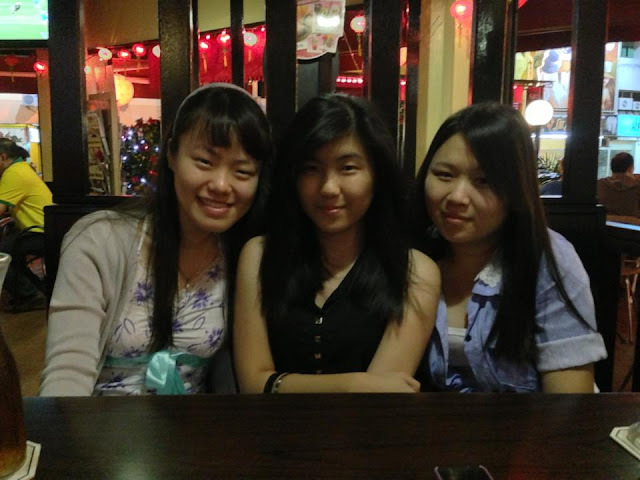 In a way, I do enjoy my simple CNY by hanging out and do some catching up with old friends. February is such a joyful month filled with eventful events. I'll blog about my Valentine's Celebration in my next post.